No. It is a simple word, uttered on a summer porch in 1936. And it will haunt Kitty Milton for the rest of her life. Kitty and her husband, Ogden, are both from families considered the backbone of the country. But this refusal will come to be Kitty’s defining moment, and its consequences will ripple through the Milton family for generations. For while they summer on their island in Maine, anchored as they are to the way things have always been, the winds of change are beginning to stir. In 1959 New York City, two strangers enter the Miltons’ circle. One captures the attention of Kitty’s daughter, while the other makes each of them question what the family stands for. This new generation insists the times are changing. And in one night, everything does. So much so that in the present day, the third generation of Miltons doesn’t have enough money to keep the island in Maine. Evie Milton’s mother has just died, and as Evie digs into her mother’s and grandparents’ history, what she finds is a story as unsettling as it is inescapable, the story that threatens the foundation of the Milton family myth. Moving through three generations and back and forth in time, The Guest Book asks how we remember and what we choose to forget. It shows the untold secrets we inherit and pass on, unknowingly echoing our parents and grandparents. 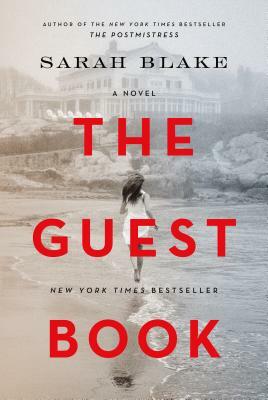 Sarah Blake’s triumphant novel tells the story of a family and a country that buries its past in quiet, until the present calls forth a reckoning.